A soft-bodied robot navigating, top to bottom, an obstacle course. 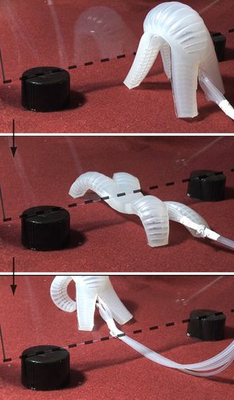 Unlike rigid robots, soft robots can be used to squeeze into tight spaces. Soft Robots are a new type of robotic structure that combines organic chemistry, soft materials science and robotics. These type of robots differ from the typical hard bodied industrial type robots used today. Soft robots have more elasticity, are flexible and move very differently from hard bodied robots that use gears and motors for movement. The movements of soft robots are based on organisms such as squid, starfish and worms. Soft robots are outfitted with rubber tentacles or arms that move and grip objects through pneumatic networks using compressed air. Now, they're working to give those robots the ability to disguise themselves. As demonstrated in an August 16 paper published in Science, researchers have developed a system – again, inspired by nature – that allows the soft robots to either camouflage themselves against a background, or to make bold color displays. Such a "dynamic coloration" system could one day have a host of uses, ranging from helping doctors plan complex surgeries to acting as a visual marker to help search crews following a disaster, said Stephen Morin, a Post-Doctoral Fellow in Chemistry and Chemical Biology and first author of the paper. "When we began working on soft robots, we were inspired by soft organisms, including octopi and squid," Morin said. "One of the fascinating characteristics of these animals is their ability to control their appearance, and that inspired us to take this idea further and explore dynamic coloration. I think the important thing we've shown in this paper is that even when using simple systems – in this case we have simple, open-ended micro-channels – you can achieve a great deal in terms of your ability to camouflage an object, or to display where an object is." "One of the most interesting questions in science is 'Why do animals have the shape, and color, and capabilities that they do?'" said Whitesides. "Evolution might lead to a particular form, but why? One function of our work on robotics is to give us, and others interested in this kind of question, systems that we can use to test ideas. Here the question might be: 'How does a small crawling organism most efficiently disguise (or advertise) itself in leaves?' These robots are test-beds for ideas about form and color and movement." Just as with the soft robots, the "color layers" used in the camouflage start as molds created using 3D printers. Silicone is then poured into the molds to create micro-channels, which are topped with another layer of silicone. The layers can be created as a separate sheet that sits atop the soft robots, or incorporated directly into their structure. Once created, researchers can pump colored liquids into the channels, causing the robot to mimic the colors and patterns of its environment. The system's camouflage capabilities aren't limited to visible colors though. The uses for the color-layer technology, however, don't end at camouflage. "What we hope is that this work can inspire other researchers to think about these problems and approach them from different angles," he continued. "There are many biologists who are studying animal behavior as it relates to camouflage, and they use different models to do that. We think something like this might enable them to explore new questions, and that will be valuable."